City of Derry AC and North Down AC have been announced as winners of the Athletics Northern Ireland Cross Country League 2012/13, after scores were totalled from the Bobby Rea Memorial XC, McConnell Shield XC, Malcolm Cup XC, North West XC, Antrim International XC and last weekend’s NI Civil Service XC at Stormont Estate, Belfast. City of Derry AC took the men’s title after finishing on 79pts, their impressive performances over Cross Country terrain has also seen them collect the prestigious Northern Ireland & Ulster Junior XC title, in January 2013. North Belfast Harriers (71pts) finished in 2nd place, while North Down AC and Willowfield Harriers both picked up a total of 35pts. In the ladies standings, it was always going to be a close battle between the ever consistent North Down AC ladies and the always closely ‘packed’ City of Derry AC team. In the end, North Down AC edged it with 76pts. City of Derry AC (71pts) took 2nd place, with Springwell Running Club (52pts) in 3rd place. Although many teams did not win prizes, all must be credited for making the league such a success. Many club’s fielded large teams on a regular basis, creating a brilliant atmosphere and excellent competition. Northern Ireland man Stephen Scullion (Clonliffe Harriers/St Mary’s University AC) has been selected to represent Ireland at this weekend’s European Indoor Championships, being held in Gothenburg, Sweden between Friday 1st March and Sunday 3rd March 2013. Although based mostly in England, Stephen regularly returns to Northern Ireland to compete. However, the ex-North Belfast Harriers athletes most notable performance of late was in Birmingham on Saturday 16th February 2013 where he recorded a new 3,000m personal best of 7:58.11 when racing against double Olympic gold medallist Mo Farah. It had been hoped that Stephen would be selected for the European Championship team, but it looked as if it would be a choice between him and Donore Harriers’ John Travers; but after West Waterford AC’s David McCarthy withdrew from the team at the weekend, both Stephen and John will now compete over 3,000m. Stephen and John, along with Rose Ann Galligan (Newbridge AC) and Claire Tarplee (DSD AC) will join the athletes already selected last week. This includes City of Lisburn AC star Amy Foster and southern based runners: Ciara Everard (UCD AC), Brian Gregan (Clonliffe Harriers), Ciaran O’Lionaird (Leevale AC), Fionnuala Britton (Kilcoole AC), Derval O’Rourke (Leevale AC). Tori Pena (Finn Valley AC) will be competing in the Pole Vault. Please see our previous article regarding pre-selected athletes (scroll down). For a more detailed report, including a feature on each athlete, please visit theAthletics Ireland website. This weekend, from Friday 22nd February until Sunday 24th February 2013; Northern Ireland athletes have been in action for their respective Universities at the British University and College Sport’s (BUCS) Indoor Championships in Sheffield, England. Mark Hoy (University of Ulster/Mid Ulster AC) breezed through his 800m heat in a winning time of 1:58.50, but bowed out in the semi-final. His 1:57.24 was enough to secure 3rd place but not quite enough to achieve qualification for the final. The event was won by Samuel Dykes (Loughborough University) in 1:52.86. Chloe Boomer (University of Ulster/Lagan Valley AC) ran well in her 60m heat, recording 7.93secs to finish in 2nd place. However, her slightly slower time of 7.98secs (4th place) in the semi-final meant that she did not make the final. The event was won by Ashleigh Nelson (Middlesex University) who ran 7.39secs. John Houston (University of Ulster/Ballymena & Antrim AC) won his 400m heat in 50.67secs, but missed out on a place in the final despite running a quicker 50.39secs (4th place) in his semi-final. The event was won by Michael Warner (Nottingham Trent University) in 47.46secs. Unfortunately, one of Queen’s University’s medal hopefuls, Christine McMahon (Ballymena & Antrim AC) was disqualified in her 400m heat. On Saturday 23rd February 2013, City of Derry AC’s Conor Bradley, who has been continually producing personal best performances recently, took part in the specially organised AAI Open Graded Indoor Meet in the AIT Arena, Athlone (Ireland). The event was organised to assist athletes hoping to achieve European Championship qualifying times before the impending deadline on Sunday 24th February 2012. Racing in the ‘mile’ event, Conor recorded a brilliant 4:02.67 to finish in 2nd place behind MSB AC’s John Coghlan (4:02.55). Although this was not enough to secure a European Championship qualifying time, it proves that Conor is fast becoming one of the provinces top track talents. Further afield; Armagh AC’s Stephen Kerr was competing over 3,000m and 5,000m at the Southland Conference Indoor Championships in Oklahoma, USA. Wearing the vest of his college, McNeese State Stephen ran 8:34.14 to finish in 4th place in the 3,000m race. This was won by fellow McNeese State student David Rooney in 8:23.77. In his 5,000m race, Stephen recorded 15:27.09 to finish in 11th place. This was also won by McNeese State’s David Rooney (14:48.62). On Sunday 24th February 2013, a number of Northern Ireland based athletes travelled South for the Woodies DIY/Athletics Ireland Inter-Club Cross Country Championships at Charleville Estate, Tullamore (Ireland). In the Senior Men’s 12km race; St Malachys AC’s Joe McAlister produced a gritty performance to finish in 2nd place. The talented Northern Ireland man chased eventual race winner Sergui Ciobanu (Clonliffe Harriers) and looked to be well in contention, until Sergui broke clear in the final lap to win in 38:26. Joe took 2nd place in 38:39 and picked up the silver medal. City of Derry AC fielded a strong team in the same race, they were led home by strong running Declan Reed in 40:21 (13th place). Emmet McGinty was next across the line in 41:40 (30th place), before Greg Roberts (42:22) and Colin Roberts (42:36) finished in 35th place and 38th place respectively. The Spartan team finished in a very credible 4th place, with Clonliffe Harriers collecting the top prize. In the Senior Women’s 8km event, North Belfast Harriers’ Breege Connolly ran an excellent race to collect the bronze medal. The marathon specialist crossed the line in 29:21 to finish in 3rd place; the race was won impressively by North Sligo AC’s in-form Mary Cullen who ran an outstanding 27:40. Armagh AC’s young Danielle Fegan (33:00) also ran well to finish in 34th place. In the earlier Junior Men’s 6km race; the St Malachy’s AC team packed extremely well and were rewarded with a silver medal in the team competition. In a race won by Sean Tobin (Clonmel AC) in 19:31, Ben Branagh (20:20) was the first of the Belfast club’s athletes to finish in 8th place. He was followed a mere eight seconds later by Paddy Robb (20:28) in 9th place. Conor Gallager recorded 21:07 to finish in 13th place, while Ronan O’Fril ran 21:34 (19th place). James Smyth (21:53) and Daryl McNicholl (23:55) also ran good races to finish in 24th place and 37th place respectively. The Junior Men’s team prize went to DSD AC. On Sunday 24th February 2013, close to one hundred and fifty athletes took to the roads of Bessbrook, County Armagh for the annual Bessbrook 10k road race. After a closely fought battle between Unattached athlete Brian Young and Newcastle AC new boy Seamus Lynch, it was Brian who eventually got the upper hand. He surged clear to break the tape in 35:17, thus picked up the winner’s prize. Seamus followed, taking 2nd place in 35:39 while Kevin McArdle (Club Unknown) claimed 3rd place after recording 37:44. In the ladies race, Caroline Wade (Newry City Runners) saw off a strong challenge from Caitlin Malone (Three Ways AC) to win in 44:21. Caitlin (44:43) settled for 2nd place ahead of Eileen Stevenson (St Peter’s AC) who took 3rd place in 45:52. On Sunday 24th February 2013, running enthusiasts from all over the province took part in the Den Dearg 10k road race in Kilclief, County Down. In near perfect conditions, close to one hundred competitors took part in the increasingly popular event. On the ‘out and back’ course, it was Larne AC’s James Brown who impressed most. Having returned to serious training over the last few months, the County Antrim man dominated proceedings, leading the field home in 34:59. John Kelly (Newcastle AC) was next to cross the finish line in 37:23 (2nd place), while Up & Runners’ John McConnell (37:58) claimed 3rd place. In the ladies race, Larne AC once again dominated. However, it was Newcastle AC’s young starlet Dearbhla Magee who stole the headlines, bringing her recent good form over cross country terrain onto the road to seal victory in 46:26. Larne AC’s Trisha Campbell (48:06) secured 2nd place, ahead of club mate and International Duathlete Jenny Magill (48:21). On Saturday 23rd February 2013, over three hundred runners took part in the Omagh CBS 5k and 10k road races. The event, organised by the Christian Brothers School (Omagh) was primarily a fund-raising effort for their charity work but attracted several high profile athletes. As predicted it was the exceptionally talented Stephen Duncan (Omagh Harriers) who controlled things from start to finish. He led from the off to secure a well-deserved win in 31:15, an excellent time considering he was alone at the front. Omagh Harriers’ club mate Paul Barbour (33:18) took 2nd place, with Annadale Striders’ Eoin Mullan (33:52) in 3rd place. There was a similar story in the ladies race, with Miread McCann winning comfortably in 41:22. Deirdre Haigney (Omagh Harriers) claimed 2nd place in 44:09, while Omagh Triathlon Club’s Rosaleen McCartan secured the final podium place in 45:11 (3rd place). In the 5k event, Omagh Harriers enjoyed further success with Brendan Collins (18:14) and Sara Moore (19:45) winning their respective categories. On Saturday 23rd February 2013, hundreds of junior, senior and veteran runners descended on Stormont Estate, Belfast for the annual Northern Ireland Civil Service Cross Country. Due to the adverse weather conditions over the past few months, organisers were forced to alter the course, moving it onto trails instead the usual cross country route. Despite this, the race will count as a cross country event for thepurposes of the Athletics NI Cross Country League and the Northern Ireland Masters Athletic Association CrossCountry League. In perfect running conditions, the junior athletes completed their competitive races. It was then the turn of the senior and veteran runners to make their way to the start line, with parliament buildings providing the perfect back drop. Both the men’s and ladies races set off together, with the men completing a four lap 8km course and the ladies completing a two lap 4.5km course. The ladies race proved to be a close affair, with Patricia O’Hagan (St Peter’s AC), Claire Connor (North Belfast Harriers), Jessica Craig (North Down AC), Catherine Whoriskey (City of Derry AC), Gillian Wasson (Springwell Running Club), Alex Kirk (Springwell Running Club) and Stephanie Hambling (North Down AC) all in contention. In the end, it was one of the cross country season’s star performers, Patricia O’Hagan (St Peter’s AC) who opened up an uncatchable lead, sealing victory in 15:39. North Belfast Harriers’ Claire Connor (15:46) claimed a well-deserved 2nd place, while Catherine Whoriskey (15:59) took 3rd place ahead of North Down AC’s Jessica Craig (4th Place – 16:12). After leading from the off, and putting on an impressive display of front running, North Belfast Harriers’ Alan O’Hara ran to an excellent victory in the men’s race. He crossed the line in 24:57, well clear of his closest competitors; Andrew Annett (Mourne Runners) and Gary Slevin (City of Derry AC) who were locked in an enthralling battle for the runners-up spot. Andrew had been running well and was in second place for most of the race, but a patient Gary left his move until the final stages and passed Andrew within touching distance of the finish line. A tired, but happy Gary Slevin recorded 25:38 (2nd place), while Andrew Annett finished in 25:39 (3rd place). 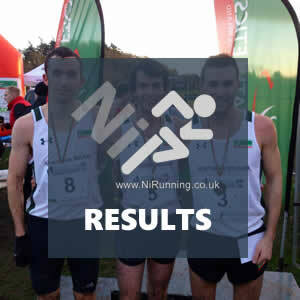 Full Results: NI Civil Service XC (Stormont) 2013 Results. Plese see our ‘Race Review’ and ‘Photo Gallery’ sections for a full race/event review and race photographs. 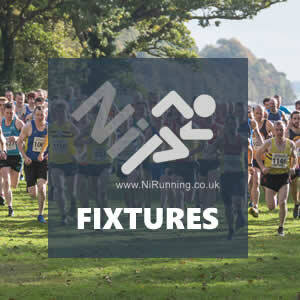 This weekend brings several high profile events, including the NI Civil Service XC at Stormont Estate, Belfast and the AAI Inter Club XC Championships in Tullamore, Ireland. Aside from these, Northern Ireland runners will take part in road races in Omagh and Kilclief and Indoor events in Athlone (Ireland) and Sheffield (England). On Saturday 23rd February 2013, the Northern Ireland Civil Service Athletic Club host their annual Cross Country event at Stormont Estate in Belfast. As the grounds around parliament buildings are so wet and heavy, organisers have been forced to alter the course, moving it onto trails. This will not put off many people, and a good quality field is expected for both the male and female races. In the Men’s 5 mile event, David Morwood (Annadale Striders), Paul Carroll (Annadale Striders), Conan McCaughey (St Peter’s AC), Ryan Holt (Willowfield Harriers), Ryan McDermott (Annadale Striders) and Alan O’Hara (North Belfast Harriers) should lead the pack. Andrew Considine (North Belfast Harriers), Francis Marsh (North Down AC), David McNeilly (Newcastle AC), Neil Carty (North Belfast Harriers) and Craig Hutchinson (Larne AC) should also be amongst the front runners. Dale Mathers (Newry City Runners), Simon Reeve (North Belfast Harriers) and Andrew Guy (Larne AC) will also hope to be in or around the top ten finishers. As this event counts towards the Northern Ireland Masters XC League, several veteran runners will also have one eye on their age category rivals. In the Ladies 3.5 mile race, Jessica Craig (North Down AC) and Patricia O’Hagan (St Peter’s AC) will battle it out at the front. Both are in fantastic form, which makes for an exciting encounter. Jessica’s North Down AC club mate Stephanie Hambling should also be in the mix, as will Gillian Wasson (Springwell Running Club), Emma Mitchell (Unattached), Geraldine Branagh (Dromore AC), Gemma Turley (Springwell Running Club) and Shileen O’Kane (Lagan Valley AC). Caroline Irwin (Springwell Running Club), Denise Mathers (Newry City Runners) and Ruth Magill (Lagan Valley AC) will all be looking for a high placing. Also on Saturday 23rd February 2013, Omagh CBS will welcome local running enthusiasts to their 5km and 10km Road Races. The event is primarily organised to raise money for charity but it should attract a decent quality field. One such quality entrant will be Omagh Harriers’ Stephen Duncan, who should win, leaving his club mates Pete Barbour and Martin Cox to jostle for the runners up spot. Pierce McCullagh (Sperrin Harriers), Dominic McCartan (Carmen Runners) and Stephen Prentice (Unattached) are the other likely candidates for prizes. Meanwhile, in the Ladies race; Karen Alexander (Sperrin Harriers), Michelle Sturm (Omagh Harriers) and Julie Butler (Omagh Harriers) could all be considered as possible contenders. However, Karen Dolan (Enniskillen Running Club), Jennifer Algar (Carmen Runners) and Grainne Kelly (Knockmany AC) will all be vying for a place on the podium. On the evening of Saturday 23rd February 2013, Athletics Ireland will host a Graded Indoor Meet at the AIT Arena in Athlone, Ireland for individuals who would like a final opportunity to reach the AAI European Championships qualifying standard before Sunday’s deadline. City of Derry AC’s Conor Bradley will be one of the Northern Ireland athletes participating in this. On Sunday 24th February 2013, runners from Northern Ireland will travel south for the AAI Inter Club Cross Country Championships in Tullamore, Ireland. The event has always attracted NI runners and on this occasion we anticipate that City of Derry AC, St Malachy’s AC and North Belfast Harriers will be well represented. Joe McAlister (St Malachy’s AC) will join City of Derry AC men; Emmett McGinty, Declan Reed, Greg Roberts and Colin Roberts in the Men’s 12km Race. The NI men will be up against some excellent competition in the form of Olympian’s Mark Keannelly (Clonliffe Harriers), Alistair Cragg (Clonliffe Harriers) and Sean Hehir (Rathfarnham WSAF) amongst others. In the Ladies 8km Race; North Belfast Harriers’ Breege Connolly, Gladys Ganiel O’Neill, Claire Connor, Judi Graham and Roisin Hughes will hope to add to their team silverware. Individually, the aforementioned North Belfast ladies and Armagh AC starlet Danielle Fegan will be chasing leading Southern based ladies Lynda Byrne (DSD AC) and Mary Cullen (North Sligo AC). Lynda has been in amazing form over Cross Country terrain recently, while Mary has been smashing her own personal bests and several course records on the road. Most recently, she ran 9:07.88 to break the Armagh International 3km Road Race course record last week. In the Junior Men’s 6km race, St Malachy’s AC will field a young but talented team; this includes Ben Branagh, Paddy Robb, Chris Connolly, Conor Gallagher, James Smyth, Ronan O’Fril and Darryl McNicholl. They will be up against Sean Tobin (Clonmel AC), who is being considered as pre-race favourite. Also on Sunday 24th February 2013, East Down AC will host the Ben Dearg 10k Road Race in Kilclief, County Down. The scenic route will take runners along the shores of Strangford Lough and past the Killard Nature Reserve; it also boasts views of the Ards Peninnsula and the Isle of Man. Reigning champion, Brendan Teer should return to defend his title but will have to fend off the challenge of fellow East Down AC member Liam Venney and North Belfast Harriers’ Adam Boyd. This talented trio could also be joined at the head of the field by Newcastle AC men David O’Flaherty, Jerome McCrickard and new boy Seamus Lynch. Should East Down AC’s Neil McCartan or Newcastle AC’s Mark Kendall decide to race, they will feature in the top ten. In the Ladies race, Anne Sandford (Lagan Valley AC) and Virginia Ervine (Mourne Runners) should be there or there abouts; leaving Monica McCrickard (Leitrim Ladies), Orla Smyth (City of Lisburn AC), Lisa Robinson (Unattached) and Alison Dougan to battle it out for the remaining podium place. Further afield, Christine McMahon (Ballymena & Antrim AC), Amy Foster (City of Lisburn AC), Mark Hoy (Mid Ulster AC), John Houston (Ballymena & Antrim AC) and Chloe Boomer (Lagan Valley AC) are all due to represent the University of Ulster at the British University & College Sport Indoor Championships (BUCS) in Sheffield, between Friday 22nd February and Sunday 25th February 2013. It is unlikely that all will feature because of the recent gruelling race schedule, but we will provide results for those who do in a summary on Sunday evening. 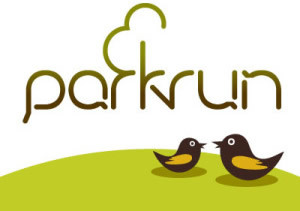 Northern Ireland’s seven ‘parkrun’ events will also take place as usual, for more information on these, or to locate your nearest event, please visit our dedicated ‘parkrun’ section within our fixtures page. City of Lisburn AC’s Amy Foster is one of eight athletes pre-selected by Athletics Ireland to compete at this years European Indoor Championships in Gothenburg, Sweden. The exceptionally talented Northern Ireland lady achieved the European standard after clocking 7.33secs over 60m at last weekend’s AAI Senior Indoor Championships, before being cruelly disqualified in the final after a false start. She will now line up against some of Europe’s best sprinters at the Championships, taking place between the 1st and 3rd March 2013. Amy will be joined on the plane by Southern based runners; Brian Gregan (Clonliffe Harriers), who currently tops the European Indoors 400m rankings. Recent 3:53.10 mile man, and 3,000m runner Ciaran O’Lionaird (Leevale AC). Derval O’Rourke (Leevale AC) and Ciara Everard (UCD AC), who hold Irish records for the 60m hurdles and 800m respectively. David McCarthy (West Waterford AC), the fastest Irish 3,000m qualifier with 7:51.24, and last but not least; Double European XC Champion Finonnuala Britton (Kilcoole AC). Pole Vault specialist Tori Pena (Finn Valley AC) will also travel. Northern Ireland man, Stephen Scullion (Clonliffe Harriers/St Marys University AC) could also be named at the close of the qualification deadline on Sunday 24th February 2013. After running the 3,000m qualifying standard and massive personal best of 7:58.11 in Birmingham last weekend it would be disappointing should he not be selected. The final 3,000m place will more than likely go to either Stephen or Donore Harriers’ John Travers who has run a slight slower 7:58.54. On Saturday 16th and Sunday 17th February 2013, at least five runners from Northern Ireland took part in the inaugural Clonakilty Back 2 Back Marathons in Cork, Ireland. The event, which takes competitors over a scenic 26.2 mile course each day, is expected to grow in popularity after its first running, with many participants enjoying the coastal route. However, with 149 entrants starting Saturday’s race and only 112 completing both days it shows just how difficult the two day race can be. Ian James (Wrexham AC) won the men’s title in 6:13:45 (2:54:39 and 3:19:04), while Sharon Woods (Mallow AC) lifted the ladies top prize in 7:08:36 (3:28:06 and 3:40:27). Steven Gibson (Marathon Club Ireland) ran two sub four hour marathons, 3:59:15 (Saturday) and 3:58:55 (Sunday) to lead the NI athlete’s home in 28th place. Not far behind was Gillian Cordner (Seapark AC), who just missed a podium place in the ladies race, she finished in 4th place after covered the distance in 3:52:40 on Saturday and 4:05:31 on Sunday, meaning that her overall time was 7:58:15. This secured 29th place overall. Another Seapark AC member, Gary Connolly crossed the line in 3:56:23 on Saturday, but ran an understandably slower 4:06:00 on Sunday. His overall time of 8:02:27 gave him a 33rd place finish. Despite beating Gary to the line on Saturday, Murlough AC’s Gerard Rowe (3:54:48) finished in 35th place after recording 4:09:08 on Sunday. His overall time was 8:04:07. Ken Beggs, a member of the 100 Marathon Club, but better known for his connection with East Antrim Harriers had an overall finish time of 8:48:55 (63rd place), after notching up 4:13:02 (Saturday) and 4:35:45 (Sunday). Another Northern Ireland man competing over long distance at the weekend was Martin Rea (North Belfast Harriers), who took part in the London 50k Ultra Marathon on Sunday 17th February 2013. The well-known Belfast based athlete made a welcome return to ultra-racing, finishing in an excellent 3rd place after completing the hilly, multi-terrain course in 3:50:32. The race was won by Danny Kendall (Serpentine Running Club) in 3:47:08. On Sunday 17th February 2013, athletes from Northern Ireland were in action at the AAI Senior Indoor Championships at the AIT Arena in Athlone (Ireland). After an exciting first day of competition on Saturday (16th February 2013), day two brought more interesting stories. Jason Harvey (Crusaders AC) claimed the National 400m title after clocking 47.94secs, and Kerry Harty (Newcastle AC) continued her excellent form with yet another podium finish. Kerry picked up a silver medal after running 4:16.36 in her 1500m race, only being beaten by world renowned Irish Olympian and current European Cross Country Champion Fionnuala Britton (Kilcoole AC) who recorded 4:13.96 for the distance. City of Derry AC’s Conor Bradley, who seems to be smashing his personal bests in nearly every race he runs, finished in 2nd place in the 3,000m final. Conor ran 8:05.29, while St Malachys AC’s Paralympic hero Michael McKillop (8:32.57) finished in 5th place. Young Newcastle AC runner Eoghan Totten also ran well to take 8th place in 8:47.95. The race was won by John Tarvers (Donore Harriers) who crossed the line in 7:58.54. Beechmount Harriers’ Curtis Woods finished in 4th place in the 200m ‘A’ final after running 22.24secs, the race was won by popular Irish runner Brian Gregan (Clonliffe Harriers). In a close 200m ‘B’ final, Lagan Valley AC’s Ben Maze (22.49secs) picked up a bronze medal after finishing in 3rd place, just 0.13secs behind Leevale AC’s David Quilligan (22.36secs) who won the race. Springwell Running Club’s Holly Clarke ran 26.24secs to finish in 6th place in the ladies 200m final, a race won by Ferrybank AC’s Kelly Proper (23.84secs). Mandy Gault (Lagan Valley AC) ran an excellent 400m race, running a new personal best of 56.46secs to finish in 3rd place. The race was won by Shauna Cannon (Brothers Pierce AC) in 55.13secs. The ladies 800m final was won by UCD AC’s Ciara Everard in 2:07.77, with Newry AC’s Aislinn Crossey (2:11.82) finishing in 6th place. In the last race of the day, the 800m final; North Down AC’s Mark Patterson crossed the line in 1:52.17 to finish in 6th place, and City of Derry AC’s Patrick Hamilton recorded 1:55.50 to finish in 8th place. The race was won by Letterkenny AC’s Mark English (1:44.48). One disappointment of the day was the disqualification of talented City of Lisburn AC sprinter Amy Foster in the 60m final. Having come through her heat in a AAI European Championship qualifying standard time of 7.33secs, Amy was being touted as the one to watch in the final. Ballymena & Antrim AC duo Dean Adams (60m) and Christine McMahon (400m) did not start their respective finals, despite qualifying quite comfortably from their heats. On Saturday 16th February 2013, the fifth race of the McGrady Financial Services Junior Cross Country Series took place at Tollymore Forest Park, just outside Newcastle in County Down. Nearly one hundred eager athletes turned out in what could only be described as perfect weather conditions. The P4 (& Under) 500m race kicked off proceeding as always, and Newcastle AC celebrated an excellent opening double victory, with Jamie Williamson (2:02) and Amy McCrickard (2:05) taking 1st place in their respective categories. Jamie and Amy have both been regular performers throughout the series. Not to be out done, Burren AC celebrated a double in the following P5 800m race. Thomas McKeaveney (2:26) won the boys race; while his club mate Izzy O’Farrell (2:45) won the girls race in impressive fashion. The P6 1000m race followed, and both the boys and the girl’s event proved to be excited contests. Danny Williamson (Newcastle AC) just edged out East Down AC’s Andrew McGratten (2nd place – 2:35) to take 1st place in 3:33. The girl’s race was a similar story, with just a few seconds separating the top two. This time around, Eve Kenneally (Newcastle AC) clocked 3:42 to finish in 1st place, just two seconds ahead of East Down AC’s Libby Maloney who ran 3:44 (2nd place). Newcastle AC’s Josh Faulkner (4:20) and Burren AC’s Niamh Scullion (4:25) won their respective boys and girls P7 1200m event, before Sarah Dougherty (Newcastle AC) ran out clear winner of the Year 8 girls 1400m race. Owen Edwards (East Down AC) won the boys equivalent in 4:43. In the Year 9 2000m race, Oisin McKinley (Burren AC) crossed the line in 6:39 to take 1st place in the boys category, while Laura Green (East Down AC) ran well to seal victory in the girls event. She finished as the clock read 7:42. The final event of the day brought the Year 10 and Year 11+ boys and girls to the start line for their 2500m race. In the Year 10 category, Burren AC’s Paraic Delahunt (8:23) won the boys race and Newcastle AC’s Eilis Doyle (9:45) won the girls race. In the oldest age category, Year 11+; Dearbhla Magee (Newcastle AC) continued her impressive series winning streak, sealing victory in 8:29. There were no male entrants in the Year 11+ category. That brings a close to this year’s McGrady Financial Cross Country Series, full results and details of the presentation night will appear on the Newcastle AC website soon. Organisers would like to thank everyone who helped out on Saturday and throughout the series as without the help it would be very difficult to organise and run the series. P4 (and Under) 500m Race: Jamie Williamson (Newcastle AC) – 2:02 and Amy McCrickard (Newcastle AC) – 2:05. Summary compiled with the assistance of Newcastle AC. For a more detailed report and race photographs, please visit the Newcastle AC website. Above picture used with the permission of Newcastle AC. On Saturday 16th February 2013, Sperrin Harriers held the fifth race of their Winter League Series at An Creagan Heritage Centre, Omagh. After having to cancel the original running of the event because of extreme weather conditions, organisers deserve credit for rescheduling the race so quickly. Covering 5 miles in distance, the race was dominated by Sperrin Harriers, with Pierce McCullagh (Sperrin Harriers) claiming another victory in the series. It wasn’t all plain sailing for the talented Harrier though; he had to see off a strong challenge from club mate Niall Brown. In the end, it was Pierce who broke the tape in 28:42, ten seconds ahead of Niall (28:52) in 2nd place. Aidan O’Hagan made it a 1-2-3 for Sperrin Harriers when he crossed the line in 29:34 to take 3rd place. Cheryl Caldwell (Sperrin Harriers), a consistent performer in the series, matched her male club mate’s success, crossing the line in 35:52 to seal a notable victory in the ladies race. Patricia Campbell (Omagh Harriers), another regular on the podium, took 2nd place in 36:57 while Unattached athlete Anne Killen (37:31) just pipped Greencastle AC’s Olivia Mullin (4th place – 37:32) to the post, claiming 3rd place. On Saturday 16th February 2013, six Northern Ireland runners joined some of the UK’s finest Mountain Runners at the Carnethy 5 Mountain Race in Penicuik, just outside Edinburgh (Scotland). The race covers 6 miles, with a total climb of 2,500ft over five challenging peaks and is always popular with Northern Ireland competitors. Over five hundred entrants started the race and it was Finlay Wild (Lochaber AC) who had the honour of collecting the prestigious winners trophy, after finishing in an outstanding 49:46. Glenn Donnelly (Sperrin Harriers) will be forgiven for missing his own club’s Winter League Series Race after picking up the 1st Overseas Male prize. He led the travelling Northern Ireland contingent home in 1:02:50 (84th place), just ahead of Ballymena Runners’ Mark Alexander (1:05:19) and Newcastle AC’s Eugene McCann (1:05:20) who finished a mere one second apart in 131st place and 132nd place respectively. Shileen O’Kane (Lagan Valley AC) followed in 1:05:41 (140th place), which saw her finish as 10th female, 3rd Vet40 and 1st Overseas Lady. Shileen’s Lagan Valley AC club mates Anne Sandford and Hazel McLaughlin also ran well, with Anne running 1:12:35 (239th place – 25th female) and Hazel crossing the line in 1:16:07 (288th place – 36th female). On Saturday 16th February 2013, 26extreme hosted the penultimate race of their Winter Series in Castlewellan Forest, County Down. After having to negotiate the course by torch light last time around, competitors had the pleasure of viewing the 10k route in day light this time. David Simpson (Ballydrain Harriers), a previous race winner in the series, stole the headlines this time around. He led from start to finish, completing the course in 34:13, thus sealing an impressive victory. David McNeilly (Newcastle AC) and Seamus Lynch (Unattached) battled throughout, but in the second half David managed to forge ahead and take 2nd place in 36:07. Seamus completed the top three in 36:14. In the ladies race, it was a similar story. Karen Alexander (Sperrin Harriers) set the pace from the off, and celebrated a comprehensive victory after clocking 39:07. This was over five minutes ahead of her closest challengers, Unattached athlete Patricia McKibbin (44:44) and Mourne Runners’ Virginia Ervine (46:07) who finished in 2nd place and 3rd place respectively. On Saturday 16th February 2013, Northern Ireland man Stephen Scullion, formerly attached to Northern Belfast Harriers but now representing Clonliffe Harriers (Ireland) and St Mary’s University AC (England) lined up against Double Olympic Champion and athletics legend Mo Farah (Newham & Essex Beagles AC/Team GB) at the British Athletics Birmingham Grand Prix. Competing over 3,000m, Stephen smashed his personal best for the second weekend in succession, clocking an outstanding 7:58.11 (7th place) this time around. The race was by Mo Farah in 7:42.00. Closer to home, several Northern Ireland runners were in action in the opening day of the AAI National Senior Indoor Championships at the AIT Arena, Athlone (Ireland). Amy Foster (City of Lisburn AC) recorded 7.33secs to qualify for Sunday’s 60m final, this time also meets the AAI standard set for the European Championships. Christine McMahon (Ballymena & Antrim AC) qualified for the 400m final after running 57.42secs, while Jason Harvey (Crusaders AC) came through his 400m heat in 49.19secs and will also compete in tomorrow’s final. Another man celebrating a new personal best is Patrick Hamilton (City of Derry AC), he ran 1:53.57 in his 800m heat to qualify for Sunday’s final. This weekend, runners from Northern Ireland will compete at events in Omagh, Castlewellan, Clonakilty, Athlone, Donadea, London and Edinburgh… and that’s only the one’s that we are aware of! On Saturday 16th February 2013, Sperrin Harriers will host the fifth race of their popularWinter League Series at the An Creagan Heritage Centre in Omagh. On this occasion, entrants will compete over 5 miles. Pius McIntyre (Foyle Valley AC) has won every race in the series that he has entered, and should do the same this time around if he makes an appearance. He will face competition from another series race winner Pierce McCullagh (Sperrin Harriers), while consistent performers; Chris Mc Peake (City of Derry AC), Aaron Meharg (Sperrin Harriers) and Jason Walsh (Omagh Harriers) will contest the remaining important places. John McCambridge (St Peter’s AC), Bryan Edgar (Springwell Running Club) and Billy Reed (East Antrim Harriers) should all make the top ten. In the ladies race, Anne Paul (City of Derry AC) could be up against Omagh Harriers’ leading lady Michelle Sturm. After several impressive performances, including a medal at the recent NI & Ulster Junior XC Championships, Michelle will be considered as hot favourite should she race. Omagh Harriers’ Caroline Miller, Patricia Campbell and Rosaleen McCarthin will feature prominently, as will Sperrin Harriers duo Cheryl Caldwell and Rosemary Hargan. Also on Saturday 16th February 2013, 26extreme will take their Winter Trail Series road show to the scenic Castlewellan Forest in County Down. As always, they are sure to attract the usual band of dedicated followers. Last time the series visited Castlewellan, the race was run in the dark with all competitors wearing head torches. However, with this being a day time race it should make things much easier, and faster. Local men David McNeilly (Newcastle AC) and David O’Flaherty (Newcastle AC) should lead the field, with both knowing the forest so well. However, Don Travers (Newry City Runners) made a welcomed return to competition and won the last 26extreme race in Donard Park last week. If he races here, it could make for an exciting battle. Behind, Seamus Lynch (Unattached), Martin Wilcox (East Down AC), Sean Goodman (Newry City Runners) and Staurt Paulin (Unattached) will all perform well. The ladies event is much more difficult to call; Kerry Speers (North Down CC) won this race last time around and may return to defend her title. Teresa Fearon (Unattached) is always in or around the top places, but may be edged out if Anne Turley (Newry City Runners), Jenny McCready (Unattached) and Catherine Gracey (Unattached) decide to race. On Saturday 16th and Sunday 17th February 2013, a number of our top athletes travel South to the new AIT Arena in Athlone, Ireland for the Woodies DIY AAI Senior Indoor Championships. Kerry Harty (Newcastle AC) has started the indoor season in fine fashion, and she will hope to continue her amazing run of podium finishes when she lines up for the 3,000m race. St Malachys AC’s Paralympic hero Michael McKillop is also due to compete over 3,000m after running a notable 14:55.05 in last night’s Armagh 5k International Road Race. He will be joined by Conor Bradley (City of Derry AC), who will step up to the longer distance after achieving a new personal best over 1500m (3:44.07) last weekend. Amy Foster (City of Lisburn AC) should compete well in her 60m and 200m events after a brilliant showing at the British Athletics Euro Trials and UK Championships in Sheffield last weekend. Dean Adams (Ballymena & Antrim AC) will also race over 60m. Curtis Woods (Beechmount Harriers) is due to run in the 200m, while impressive winner at last weekend’s AAI Junior Indoor Championships, Christine McMahon (Ballymena & Antrim AC) should record another victory over 400m. Jason Harvey (Crusaders AC) will also run well in his 400m event. Also on Saturday 16th and 17th February 2013, at least five runners from Northern Ireland will take part in the difficult, but extremely rewarding inauguralClonakilty Back 2 Back Marathons (www.clonakiltyback2backmarathons.com) in Cork, Ireland. Anyone who has covered the 26.2 distance before will appreciate how much it takes out of you, so to line up for a second marathon the very next day is an excellent achievement. Long distance junkies Gillian Cordner (Seapark AC) and Gary Connolly (Seapark AC) will be joined by Gerard Rowe (Murlough AC), Ken Beggs (East Antrim Harriers) and Steven Gibson (Unattached) as they embark on the 52.4 mile (two day) challenge, traversing some of West Cork’s most spectacular coastal roads. Saturday 16th February 2013 will also see Ultra Running enthusiasts travel to Donadea Forest, County Kildare (Ireland) for the Donadea 50k Ultra Marathon. The race, which consists of five 10k loops of the forest has been selected as the Irish 50k Championships and will therefore attract some of the island’s top distance runners. At present, the only Northern Ireland participant that we are aware of is Darren Moan (Orangegrove AC). One man not travelling to Donadea is Ultra Running specialist Martin Rea (North Belfast Harriers), he will be competing in the London 50k Ultra Marathon on Sunday 17th February 2013. After seeing his last mainland race cancelled because of horrendous weather conditions, Martin will be eager to get back to long distance racing and especially to an event that he has previously won. In Scotland, keen Northern Ireland Mountain Runners; Mark Alexander (Ballymena Runners), Glenn Donnelly (Sperrin Harriers) and Eugene McCann (Newcastle AC) will join Lagan Valley AC trio Shileen O’Kane, Hazel McLaughlin and Anne Sandford at the 43rd Carnethy 5 Mountain Race. The event, hosted by Carnethy Hill Running Club is held in Penicuik just outside Edinburgh and is very popular with Northern Ireland runners, with large groups travelling every year to take on the notoriously difficult 6 mile course, with includes a total climb of 2,500ft over five summits. Woodies DIY AAI Senior Indoor Championships preview compiled with the assistance of Athletics Ireland, picture used above courtesy of BBC Northern Ireland. On Thursday 14th February 2013, thousands of athletes and spectators descended on Armagh for the 23rd running of the Armagh International Road Races. Held within the historic ‘Mall’ area, in the heart of the City Centre, the course is surrounded by iconic buildings which provided the perfect backdrop for any race photography. The evening kicked off with nine junior races, with nearly all having upwards of one hundred participants. As the junior athletes basked in the glory of their achievements, the International Ladies/Open Ladies/Veteran Ladies/Junior A and Junior B Ladies toed the line for their 3km race. After a short wait, while the astute race officials made absolutely sure that all the athletes were behind the marked start line, the horn sounded and the runners set off. Almost immediately, Mary Cullen (North Sligo AC) headed for the front, where she was joined by Ava Hutchinson (DSD AC), Kerry Harty (Newcastle AC), Claire Duck (Leeds City AC), Mary Kate Champagne (USA), Ellie Stevens (Loughborough University), Rachel Bamford (Otley AC) and Sarah Hood (Tipton AC). As the race progressed, Mary continued at a relentless pace and gradually broke clear of the group. She was followed by fellow Irish runner Ava Hutchinson, while several of the others tussled for the final podium place. Whilst the athletes completed their final lap, spectators scurried to get a position close to the finish, and as they did so Mary Cullen came into sight. Looking strong, the recently crowned Raheny 5 course record holder (25:55) covered the remaining yards effortlessly and crossed the line in a new Armagh 3km ladies course record of 9:07.88. Ava Hutchinson (9:16.96) finished well to take 2nd place, while Northern Ireland lady Kerry Harty (Newcastle AC) produced an excellent final lap to secure a well-deserved 3rd place finish in 9:27.09, her best time over the course to date. North Belfast Harriers’ Breege Connolly (9:51.38) was the second Northern Ireland finisher in 10th place, while her club mate, the in-form Claire Connor recorded 10:25.49 to claim 19th place and was the third NI lady home. Current Junior B category course record holder, Yasmin Wilson (Ballyclare HS) stepped up to the mark, winning the Junior A category in 10:38.72. Catriona McGloin (Beechmount Harriers) had the honour of collecting the Junior B award, after crossing the line in 11:18.61, and Louise Rudd (Stockport AC) was the first female veteran finisher in 10:11.10 (14th place). The crowd barely had time to draw breath before the extremely efficient time-keepers/officials set off the International (Confined) Men’s 5km race. Due to the fact that the entrants had to have run sub seventeen minutes to enter the race, it was common knowledge that it was going to be a quick race. However, the pace the men covered the first lap in was nothing short of breath-taking! It was a pleasant suprise to see Northern Ireland man Scott Rankin (Foyle Valley AC) head the massive lead group as they came through the first lap, Brendan Gregg (USA), Stuart Gibson (Cambuslang Harriers) and Eric Ashe (USA) were also amongst the front runners. Eventually, the lap speed began to regulate and Brendan Gregg took charge, with Andrew Wils (New Marske Harriers), Ethan Shaw (USA), Joe McAlister (St Malachy’s AC), Richard Weir (Derby AC), Paul Pollock (Annadale Striders) and Tristan Mannix (USA) all still in the mix. As the bell sounded and the runners went into their final lap, several surges were made but by the time they had returned to the finish area it was obvious that it was going to be close. A group of approximately five runners charged towards the finishing tape, and in the end it was American Ethan Shaw who had the honour of breaking it in a winning time of 14:11.71. Richard Weir (Derby AC) and our very own National Half Marathon and Marathon Champion Paul Pollock (Annadale Striders) finished neck and neck, but it was Richard (14:12.40) who just edged it, with Paul taking 3rd place in 14:12.46. St Malachys AC’s Joe McAlister (14:26.92) was the second Northern Ireland man to finish in 13th place, while Kevin Seaward (St Malachy’s AC) crossed the line in 14:40.66 to secure 22nd place, making him the third Northern Ireland finisher. Special mention must go to early leader Scott Rankin (Foyle Valley AC), although he fell off the early pace he managed a staggering twenty two second personal best after clocking 14:42.09. The final race of the evening brought the Male Open, Male Vet’s, Junior A and Junior B runners to the start line. Like the earlier races, this was an exciting affair with the leading runners altering positions time after time until the very end. Niall Robinson (North Down AC) and Robbie Matthews (Dunshaughlin AC) continually took on the pace but it was Lagan Valley AC’s Conal Kirk who held on until the closing stages to make the decisive move, in the final straight he made a well timed surge to seal an impressive victory in a new course record of 8:46.52, this also secured the Junior A title for the Belfast based man. North Down AC’s Niall Robinson (8:49.73) was next across the line in 2nd place, making him the 1st Male Open competitor home. Dunshaughlin AC’s Robbie Matthews (8:51.57) finished in 3rd place overall, making him 2nd in the Male Open category and Stewart Orr (Cambuslang Harriers) completed the top three Male Open finishers in 8:58.14 (4th place overall). Francis Marsh (North Down AC) was the first veteran finisher in a brilliant 9:19.46 (8th place), while pre-race favourite David Robertson (Cambuslang Harriers) ran out clear winner of the Junior B category. On Thursday 14th February 2013, Armagh AC will host their annual ‘Armagh International Road Race’ for the 23rd time. The hugely successful event, one of the highlights of the Northern Ireland racing calendar will bring the picturesque ‘Mall’ in Armagh City Centre to a halt as athletes from all over the world compete for the prestigious titles on offer. The exciting and always atmospheric night of racing (sponsored by Brooks Running) will begin at 6.30pm with a number of Juvenile Races taking place before the ‘high profile’ events commence at 8.05pm. The first of these will be the Ladies 3km Race, which will feature talent such as Commonwealth Games gold medal winner and Oylmpic finalist Lisa Dobriskey (Loughborough University), regular English International athlete Ellie Stevens (Loughborough University), Northern Ireland’s leading female middle distance runner Kerry Harty (Newcastle AC), recent Euro XC team gold medallist Ava Hutchinson (Ireland/DSD AC) and former IAAF Antrim International XC Champion Mary Cullen (North Sligo AC) who clocked 25:55 to win the Raheny 5mile Road Race last month. These five ladies will battle it out at the front, and if they work together it could see the course record of 9:15, set by Kate Reed (Bristol & West AC) in 2006 tumble. Boasting personal bests quicker than this, both Lisa and Mary are the most likely candidates to secure the title. However, the remaining three cannot be ruled out, nor can American’s Joan Bohlk and Mary Kate Champagne. Other notable entrants are Katie Good (Stockport AC), Claire Duck (Leeds City AC) and Louise Rudd (Stockport AC), all three are capable of running sub ten minutes which should ensure a top ten finish. Most of Northern Ireland’s top ladies will also be in action, which should make for an enthralling race. Kerry Harty, as mentioned above, will be in the lead group, while Breege Connolly (North Belfast Harriers), Patricia O’Hagan (St Peter’s AC), Jessica Craig (North Down AC), Danielle Fegan (Armagh AC), Catherine Whoriskey (City of Derry AC) and Emma Mitchell (Banbridge AC) will all be hoping for a high placing. In the veteran ladies categories, Stephanie Hambling (North Down AC) should perform well in the Vet40 standings, while Vet45’s Helen Stockdale (Clones AC), Donna Evans (Monaghan Phoenix AC) and Geraldine Branagh (Dromore AC) will face interesting competition in the form of French pair Isabelle Caderon and Cristina Chatelaint, both of Staines AC. Yasmin Wilson (Lagan Valley AC), the current ‘Junior B’ course record holder will race as a ‘Junior A’ this year and has the potential to win the category. In the ‘Junior B’ section; Amy Hamill (Glaslough Harriers), Olivia Diamond (Balmoral Harriers) and Emma Laverty (Lagan Valley AC) will all want to impress. In the confined Men’s 5km race, which requires all entrants to have run sub seventeen minutes for the distance, there will also be a wealth of talent on show. Brendan Gregg (USA), James Walsh (Leeds City AC), Samuel Alexander (USA), Luke Cragg (Runners Life/Leeds City AC) and Mark Keneally (Clonliffe Harriers AC/Brooks) are sure to set the pace, and should be joined by speedsters Dan Garbutt (Durham City AC), Simon Jones (Runners Life), Eric Ash (USA) and Dewi Griffiths (Swansea AC). Northern Ireland man Eddie McGinley, usually of Annadale Striders but representing Liverpool Harriers on this occasion, possess the quality to be in or around the top ten if he manages to shake off a recent niggle. A high placing won’t come easy though, with the likes of Adam Clarke (Sweatshop Real Runners), Andrew Wils (New Marske AC), Ian Rowlinson (Tipton AC), Tristan Mannix (USA), Matt Bowser (Lincoln Wellington AC) and Nigel Stirk (Tipton AC) all intent on catching the headlines. Aside Eddie, there are quite a number of other Northern Ireland men who will be hoping to smash their personal bests. National Half Marathon and Marathon Champion Paul Pollock (Annadale Striders) and club mate Andrew Agnew will be chased by Connor Magill (North Belfast Harriers), Scott Rankin (Foyle Valley AC), Declan Reed (City of Derry AC), David Morwood (Annadale Striders), Emmett McGinty (City of Derry AC), Shane Kerr (Armagh AC), Andrew Hicks (Dromore AC) and Paralympian Michael McKillop (St Malachy’s AC) amongst others. The final race of the evening will see the Men’s 3km course record holder Ciaran Doherty (Letterkenny AC) attempt to better his 8:43.15 from last year. He’ll be pushed all the way by Stewart Orr (Cambuslang Harriers) who has previously bettered the time elsewhere, and North Down AC duo Niall Robinson and Michael Dyer who are both coming off a strong winter Cross Country season. Other podium chasers could come in the form of Daniel Diamond (Balmoral Harriers) and Luke Allen (St Mary’s University AC) who have both clocked sub nine minutes. In the associated veteran men’s race; Francis Marsh (North Down AC), Paul Blaney (North Belfast Harriers), Paul Elliot (North Belfast Harriers) and Terry Aiken (North Down AC) will all be considered as strong contenders for their respective categories. The ‘Junior A’ and ‘Junior B’ categories will also be included within this race, and local men Maxi Walmsley-Pledl (Armagh AC), Conal Kirk (Lagan Valley AC) and Odhran Copeland (Beecmount Harriers) will all be hoping to get their hands on the ‘Junior A’ award, while Connor McQuillan (North Belfast Harriers) and Niall McIlhatton (Beechmount Harriers) will find it difficult to catch David Robertson (Cambuslang Harriers) in the ‘Junior B’ section. It’s sure to be a night of top class racing, with plenty of talent on show. The well organised, family orientated event makes for an excellent evening out and spectators are encouraged to attend and support the athletes. Northern Ireland runners travelled to the new AIT Arena in Athlone, Ireland this weekend (Saturday 9th and Sunday 10th February 2013) for two days of fierce competition. On Saturday 9th February 2013, Olympian Paul McKee (Beechmount Harriers) contested the Vet35 60m and 200m at the‘AAI National Masters Indoor Championships’. After being touted as a major favourite to pick up two gold medals before the event, Paul did not disappoint. He won the 60m in an excellent 7.19secs, before completing a brilliant double; taking the 200m title in 22.36secs. On Sunday 10th February 2013, it was the turn of the younger athletes to take centre stage, and they did just that. Taking part in the ‘Woodie’s DIY AAI Junior and Juvenile Indoor Championships’, several Northern Ireland based runners picked up medals. Jack McCloskey (City of Derry AC), who had won the NI & Ulster 200m Juvenile Indoor title in Magherafelt a day earlier, won the 200m race in 23.03secs. Lagan Valley AC’s Conall Kirk (1:55.29) picked up the Junior Men’s 800m gold medal, while Willowfield Harriers’ Andrew Wright (1:56.93) collected bronze in the same race. Mark McGarvey (City of Derry AC) won silver after clocking 8.18secs for the 60m hurdles. He was beaten by impressive Annalee AC sprinter Andrew Creamer in 8.09secs. Lagan Valley AC’s Ella Davis (2:31.92) finished 6th in the 800m Junior Women’s event, which was won by Louis Shanahan (Leevale AC) in 2:24.20 before Conor Bradley (City of Derry AC) recorded a new personal best of 3:44.07 to finish in 2nd place in the specially arranged Senior Men’s 1500m race, only beaten by the brilliant John Travers (Donore Harriers) who ran 3:43.53. As the U-23 races began, Jonathon Brownlee (Ballymena & Antrim AC) and Ben Maze (Lagan Valley AC) enjoyed two competitive battles, with Jonathon (2nd place – 7.07secs) just edging out Ben (3rd place – 7.07secs) over 60m. This race was won by Edmund O’Halloran (Leevale AC) in 7.06secs. While, in the 200m the roles were reversed as Ben took 3rd place in 22.42secs with Jonathon (22.49secs) finishing just behind in 4th place. This event was won by Unattached athlete Curtis Woods in 21.91secs. Jason Harvey (Crusaders AC) recorded a new personal best of 47.87secs and picked up a bronze medal in the 400m, Thomas Barr (Ferrybank AC) took gold in 47.41secs. North Down AC celebrated as their athlete Jordan Stokes (4:12.64) finished in 3rd place in the closely fought 1500m race, which was won by St Johns AC’s Damien Landers (4:11.90). Lagan Valley AC runner Chloe Bloomer narrowly missed a podium finish in her 60m and 200m races, she ran 7.87secs to finish in 5th place over 60m, and 26.18secs to finish in 4th place in her 200m race. The respective races were won by Dublin City Harriers’ Catherine McManus (7.59secs) and Steffi Creaner (24.40secs). Exciting prospect, Christine McMahon (Ballymena & Antrim AC) was a clear winner in the 400m race. She crossed the line in 55.33secs, over two seconds clear of her nearest challenger. In the 1500m, Rachel Gibson (North Down AC) finished in 2nd place after running 4:56.76, while City of Derry AC’s Amy McDaid just missed out on 3rd place after finishing in 5:01.79 (4th place). Full Results: Woodie’s DIY AAI Junior and Juvenile Indoor Championships 2013 Results – The AAI National Masters Indoor Championships 2013 Results will be added when they are available. This weekend (Saturday 9th and Sunday 10th February 2013) three of Northern Ireland’s top athletes took on the UK’s best at the British Athletics Indoor European Trials & UK Championships in Sheffield. On Saturday 9th February 2013, Amy Foster (City of Lisburn AC) won her 60m heat in 7.47secs, before recording 7.43secs (4th place) in her semi-final to reach the final. In the early evening final, which boasted a world class line up; Amy completed the 60m distance in 7.44secs. This was slower than her season and personal best but it looks as if this could be an excellent year for the talented young lady. The final was won by former IAAF World Youth Championships gold medallist Asha Philip (Newham & Essex Beagles) in 7.15secs. On the same evening, Stephen Scullion of North Belfast Harriers, but wearing the blue and white quartered vest of St Mary’s University AC, was up against an outstanding field in his 3,000m race. This included two time Armagh International Road Race podium finisher and defending UK Champion Johnny Mellor (Liverpool Harriers). In an exciting race, Stephen featured well throughout, but in the end it was Bristol & West AC’s David Bishop who made a late surge to claim the victory in 8:06.98. Stephen finished in an excellent 7th place, recording a new 3,000m personal best of 8:10.78. On Sunday 10th February 2013, Kerry Harty (Newcastle AC) produced an excellent performance in the 3,000m. Running alongside the likes of Jessica Judd (Chelmsford AC), Ellie Stevens (Birchfield Harriers) and Lily Partridge (Aldershot, Farnham & District AC), Kerry just missed out on a podium finish but ran a new indoor personal best of 9:20.95 (4th place). The race was won by Lauren Howarth (Leigh Harriers) in 8:56.48. Further afield, On Saturday 9th February 2013 City of Derry AC’s JP Williamson who is currently studying at Lindsey Wilson College in America took part in the ‘DePauw University Invitional Indoor Meet’. Competing as part of a relay team and also as an individual, JP had to run in two one mile races within an hour. He covered his relay leg for Lindsey Wilson College in 4:22, guiding them to a 2nd place finish before running his individual one mile race in 4:25 (5th place). On Saturday 9th February 2013, junior athletes from Northern Ireland and Ulster descended on the Meadowbank Sports Arena, Magherafelt for the Northern Ireland and Ulster Juvenile Indoor Championships. In the traditionally cold, but impressively kitted out arena there were some excellent performances from the future stars of Northern Ireland running. The Boys U-18 400m race kicked off proceedings and it was City of Derry AC’s Martin McGeady (53.38secs) who caught early leader Ryan McIlroy to seal victory. Anna Lawther (Ballymena & Antrim AC) shook off Lagan Valley AC duo Emma McAllister and Rachel Miller to win the Girls U-18 400m event in 63.52secs. Alan Curtis (Ballymena & Antrim AC) made it two wins in a row for the Antrim Forum based club when he claimed a well-deserved victory in Boys U-19 400m race, running 53.36secs. Meanwhile, in the Girls U-19 equivalent it was City of Derry AC’s Jenny O’Brien (60.67secs) who made the headlines, narrowly beating club mate Tamara Boyle. Next up were the U-12 Boys and Girls for their 600m races, but with so many entrants these had to be contested over several races with the top three times overall dictating the podium places. In the Boys category, Conor Black’s (Cranford AC) Race 1 winning time of 1:50.48 was enough to ensure he finished in 1st place. Finn Valley AC’s Daniella Jansen (1:59.86) won Race 2 of the Girls U-12 event and was crowned NI & Ulster Champion. The U-13 Boys and Girls 600m race followed on from the U-12’s, with several races and the top three times collected Gold, Silver and Bronze. Jack Gillespie (Finn Valley AC), a certain star of the future ran out clear winner here after clocking 1:47.88 in Race 3. The Girls category had an outstanding forty four entrants, but it was Aine Corcoran (Shercock AC) who impressed most. A Race 1 winning time of 1:50.90 led to a convincing overall victory for the exceptionally talented youngster. After an excellent start by Omagh Harriers’ Jack O’Neill in the U-16 Boys 800m race, it was Paul Peppard (Monaghan Phoenix AC) who crossed the line in 1st place, after running 2:15.80. In the U-16 Girls 800m event, Springwell Running Club’s Aife Mc Sheffrey (2:25.26) looked comfortable as she led from start to finish. Dromore AC’s Rebekah Nixon (2:32.15), a regular competitor on the senior scene also ran well to claim 2nd place. Event eleven on the official race programme brought the U17, U-18 and U-19 Boys to the start line for their combined 800m race. In a close race, Roland Soris (Annalee AC) won the U-17 title in 2:13.29, while City of Derry AC’s Shane McGowan (2:04.72) and Cranford AC’s Christopher Murray (2:07.13) won the U-18 and U-19 titles respectively. The U-17 and U-18 Girls also ran their 800m race together, this turned out to be a fantastic dual between U-17’s Aoife Laverty (City of Derry AC) and Clodagh O’Reilly (Annalee AC). Cloadagh led the field out but hard worker Aoife remained calm and gradually reeled the Annalee AC athlete in, she (Aoife) then made an unstoppable surge to victory in 2:23.31. In the U-18 category, Anna Lawther (Ballymena & Antrim AC) picked up her second title of the day, crossing the line in 2:31.56 after earlier winning the 400m gold medal. In the Boys U-14 800m category, Aaron McGlynn (Finn Valley AC) produced an excellent performance to achieve the fastest overall time out of the two races, meaning that he was awarded the title. He recorded an impressive 2:23.70. The the Girls U-18 400m race was a similar story, with competitors having to be split into two races and the three quickest overall runners making the podium. Ballymena & Antrim AC’s Rachel Brown’s Race 2 winning time of 2:32.92 was enough to see off Letterkenny AC’s Laura Crossan (2:38.77) and Ballymena & Antrim AC’s Emma Hutchinson (2:39.88). The U-15 Boys were next to toe the line for their 800m race, and it was Jake Harbinson (Ballymena & Antrim AC) who finished in 1st place after running 2:20.11. In the Girls equivalent, Monaghan Phoenix AC’s Niamh Malone (2:26.30) took the gold medal. After the earlier Boys and Girls U-16 200m heats, the Boys lined up for their final; Ciaran Barnes (City of Lisburn AC), who had come through the heats with the fastest time (24.91secs) improved even further to seal victory in 24.72secs. In the Girls final, it was a battle between the two fastest qualifiers; Aine Brady (Annalee AC) and Lydia Mills (Ballymena & Antrim AC), but in the end it was Lydia who won in 27.15secs. The U-17 Boys 200m race brought no surprises, with Orchard County AC’s Glenn Cairns (23.76secs) running out clear winner after his impressive display in the heats. The Girls race proved a similar story, with City of Lisburn AC’s Roseanna McGuckian (26.05secs) winning by just over two seconds. In the much anticipated U-18 Boys 200m race, City of Derry AC’s Jack McCloskey (23.18secs) just edged out Ballymena & Antrim AC’s Ben McKeown (23.97secs) before Unattached athlete Christina Logue (26.92secs) won the U-18 girls 200m event. Conor McCaffery (Glaslough Harriers) won the U-19 200m final in 25.70secs, while Heather Carson (26.64secs) added to Ballymena & Antrim AC’s success with an outstanding win in the Girls race. The distances were upped a short time later as the U-16 Boys lined up for their 1500m final, during which Amando Bamisile (Willowfield Harriers) showed why he is considered as such an exciting prospect. The Belfast based youngster clocked 4:41.15 to take the NI & Ulster Indoor title. Glaslough Harriers’ Amy Hamill won the girls category just as impressively, crossing the line just under ten seconds ahead of her nearest competitor in 5:06.54. When the U-17, U-18 and U-19 Girls set off in their combined 1500m event, young Annalee AC star Clodagh O’Reilly made up for her earlier lose in the 800m with an excellent display here, leading the entire field come in 4:50.81, thus making her the U-17 champion. Milford AC’s Gillian Marley (5:31.15) won the U-18 category, while City of Derry AC’s Amy Jackson (4:52.88) won the U-19 event. In the final individual running event of the day, the Boys U-17, U-18 and U-19 age groups combined for their 1500m race. Conor Morrison (Letterkenny AC) ran well to win in 4:27.66, this in turn made him the U-18 champion. Oisin Gallen (Finn Valley AC) finished in second place overall, but his time of 4:28.08 was enough to secure a good win in the U-17 category. There were no U-19 finishers. City of Lisburn AC excelled in the relay events, picking up three titles; the Boys U-15 200m (1:50.47), Girls U-16 200m (1:55.88) and Girls U-17 200m (1:55.44) titles. Finn Valley AC struck gold in Girls U-12 100m (59.39secs) and the Boys U-13 100m (57.76secs) events, while Cranford AC won the Boys U-12 100m in 61.29secs. Shercock AC (57.89secs) collected the trophy in the Boys U-13 100m race and Lifford AC (2:02.03) and Ballymena & Antrim AC (2:05.04) won the Boys U-14 200m and the Girls U-14 200m races respectively. On Saturday 9th February 2013, Springwell Running Club hosted their annual ‘Roe Valley Trail Race’ at Roe Valley Country Park, Limavady. Almost one hundred entrants took to the two lap course, measuring 8km. After the junior races had been run, the ladies set off, and as anticipated it was Sperrin Harriers’ Karen Alexander who set the pace. A confident competitor on the trails, Karen led comfortably and eventually made it two wins in as many weeks as she crossed the line in 30:38. Springwell Running Club had cause to celebrate as two of their members followed, with Alexandra Kirk (31:31) and Gemma Turley (31:42) in 2nd place and 3rd place respectively. The Veteran Men were next to hear the start gun, and in a field dominated by Ballymena Runners, it was consistent performer Mark Alexander (Ballymena Runners) who broke the tape in 29:30. His club mate, the ever improving Noel Connor was next home in 29:35 (2nd place), with Springwell Running Club’s David Jackson (30:24) taking 3rd place. The final race of the day was the closely fought Male Open, with a talented field on show it was the strong running Scott Rankin (Foyle Valley AC) who proved too hard to beat. Highlighted as one of the most improved athletes of late, Scott lived up to his reputation and completed the course in 26:40. City of Derry AC duo Richard Johnston and Chris McPeake finished close behind, with Richard taking 2nd place in 26:58 and Chris completing the top three in 27:18. Another weekend of quality racing lies ahead for Northern Ireland runners, both close to home and also further afield. On Saturday 9th February 2013, Springwell Running Club will host their annual ‘Roe Valley Trail Race’ in Roe Valley Country Park, Limavady. Measuring 8km in distance, the event should attract a record turn-out, with a large amount of entries expected from Foyle Valley AC, Sperrin Harriers, City of Derry AC, Ballymena Runners and Springwell RC themselves. Scott Rankin (Foyle Valley AC) should be amongst the front runners after consistent races over Cross Country terrain, the talented athlete will be glad to get back onto a firmer surface. His Foyle Valley AC club mate Pius McIntyre should join him at the head of the field, along with Sperrin Harriers duo Glenn Donnelly and Pierce McCullagh and Ballymena Runners’ Iain Taggart should he enter on the day. Another likely competitor will be Mark Alexander (Ballymena Runners) who has been running well on the trails recently, with decent performances in the Sperrin Harriers Winter League Series. Chris Mc Peake (City of Derry AC) may also participate, and will play a part at the front if he does. In the ladies race, previous winners Anne Paul (City of Derry AC) and Alison Rankin (Springwell Running Club) should run, while Sperrin Harriers’ Karen Alexander could also turn out. If she does, it will hamper both Anne’s and Alison’s chances of having their names on the trophy a second time. Anne Sandford (Lagan Valley AC) won the 26extreme Winter Series Race in Belfast last week and may attempt a podium finish here, while local ladies Caroline Irwin (Springwell Running Club), Cheryl Cladwell (Sperrin Harriers) and Gemma Turley (Sprinwell Running Club) could also be contenders for a high placing. Also on Saturday 9th February 2013, future Northern Ireland stars will take to the track at the brilliant Meadowbank Indoor Arena, Magherafelt as part of the ‘NI & Ulster Junior Age Group Championships’. This will be the first part of the two day competition, with the second day taking place at UUJ, Jordanstown (on Saturday 2nd March 2013). As always, Ballymena & Antrim AC will be well represented, with the likes of Ryan McIlroy, Ben McKeown, Caleb Dempsey and Emma Hutchinson all due to compete. Beechmount Harriers’ duo Christy Conlon and Niall McIlhatton will hope to place highly, as will Jack McCloskey (City of Derry AC), James Smyth (St Malachy’s AC), Brendan McCambridge (North Belfast Harriers) and Conor McQuillan (North Belfast Harriers). On Sunday 10th February 2013, North West Triathlon Club will hold the final race of their popular and competitive ‘NWTC Winter 5km Road Race Series’. Conor Doherty (City of Derry AC), an impressive winner in race two of the series with what has proved to be the quickest time to date (16:41) will be considered as pre-race favourite, although Unattached athlete Paddy Nicell and consistent performer Martin Gormley (Letterkenny AC) may think differently. Gavin Doherty (NWTC), Gareth King (Foyle Valley AC), Declan Doherty (Foyle Valley AC) and Mark Mullan (City of Derry AC) all have the potential to finish well up should any of the previously mentioned men have a bad day. In the ladies race, Catherine Whoriskey (City of Derry AC) produced the best run of the series when she finished in third place overall (thus winning the ladies category) in the opening race. Should she run in this race, she will prove extremely difficult to beat. Fellow City of Derry AC athletes Hannah Shields and Miriam Bridge, both of whom have produced good performances of late will hope to finish in a podium place, but may have to fend off willing challengers Catherine Woods (Triangle TC), Paul McGilloway (City of Derry AC), Caroline McMenamin (Foyle Valley AC) and Lorraine Carlin (BOLT). Also this weekend: Several Northern Ireland runners will travel South to race at the newly built AIT Arena in Athlone, Ireland. On Saturday 9th February 2013 decorated Northern Ireland and Ireland athlete Paul McKee (Beechmount Harriers), a popular figure within the local scene will lace up his spikes to compete in the 60m and 400m at the ‘AAI National Masters Indoor Championships’. While on Sunday 10th February 2013, Christine McMahon (Ballymena & Antrim AC) and Katie Kirk (Lagan Valley AC) well compete in the same arena. Both will take part in the ‘Woodie’s DIY AAI Junior and Juvenile Indoor Championships’, with Christine taking on the 400m and Katie the 800m. Further afield, Kerry Harty (Newcastle AC) will hope to continue her excellent early season form at the ‘British Athletics European Indoor Trails and UK Championships’, being held at the EIS Arena in Sheffield, England. On this occasion Kerry will take a step up in distance, having competed over 1500m recently, she will be racing over 3000m this time around. Amy Foster (City of Lisburn AC) will join Kerry in Sheffield, as will Stephen Scullion (North Belfast Harriers) who will be competing in the AAA 3km race. On Thursday 7th February 2013, competitors in the 26extreme Winter Series travelled to Donard Park, Newcastle for the latest instalment in the well followed series. Head torches alight, runners set off on the 10k course, which ascended above the forest’s tree line allowing each participant a stunning view of the well-lit County Down shoreline. Stunning views and long climbs aside, it was Don Travers (Newry City Runners) who set the pace throughout. The talented multi-sport enthusiast was chased all the way by current NIMRA Mountain Running Champion Stephen Cunningham (Mourne Runners), but he held on to his slender lead to break the tape in 42:53, just six seconds ahead of Stephen (42:59) who took 2nd place. Stuart Paulin (Unattached) claimed 3rd place in 43:08. The ladies race was extremely close, with Anne Turley (Newry City Runners) just piping Jenny McCready (Unattached) to the post, both received an official chip time of 1:00:39. The battle for 3rd place was exactly the same, but it was Liz Graham (Unattached) who beat Joy Morgan (Unattached) across the line, again both clocked the same chip time of 1:08:11. Top 3 Ladies: 1st Anne Turley (Newry City Runners) – 1:00:39, 2nd Jenny McCready (Unattached) – 1:00:39, 3rd Liz Graham (Unattached) – 1:08:11. 26extreme, organisers of some of Northern Ireland’s most exciting running events, such as the Mourne Way Marathon and Causeway Coast Marathon have announced their latest offering. The new event will take place on Sunday 8th September 2013 and will attract many Northern Ireland running enthusiasts, especially given it’s connection with an immensely important part of the country’s history. The ‘TQ101k’ Ultra Marathon will start in the Titanic Quarter, Belfast and continue 50.5k towards Donaghadee before turning back and return to the finish in Belfast. The 101k competitors won’t be running alone, as they will be joined on the home straight by the TQ50k and the TQ25k entrants. 101k – Out and back – Starting in Titanic Quarter. 50k – Linear route – Competitors will be transported to start line by bus. 25k – linear route – Competitors will be transported to start line by bus. This is an event not to be missed! Route maps and further details will be uploaded to www.26extreme.com shortly! Entries open MARCH 2013! Another exciting announcement has been made this week, with regard to road racing in Northern Ireland. Belfast is to host a new Half Marathon, on Sunday 22nd September 2013. 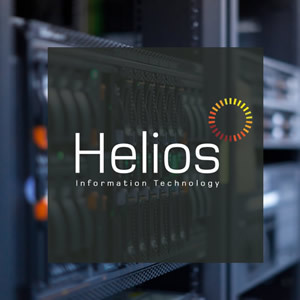 “We’ve been considering holding a half marathon for a number of years now, and this seemed the appropriate time to launch such an event for the first time. “Due to the logistics of organising the main marathon, and the associated events on the day, it is not feasible for us to hold a half-marathon at the same time as the main event, and so we have decided to hold this event in September,” Danny explained. “This means that it will be the ideal opportunity for those intending to take part in the main event to gauge how their training is going and the progress they are making. The Deep RiverRock Belfast City Marathon is sponsored by Athletics Northern Ireland, Belfast City Council, Daily Mirror, Podium 4 Sport, Saucony, Sport Northern Ireland, Tayto, Translink and U105. This year’s official charity is Cancer Focus Northern Ireland. Belfast Half Marathon article taken from Athletics NI website. On Sunday 3rd February 2013, athletes from all over Ireland travelled to Gransha Park, Derry/Londonderry for the Athletics Ireland organised Masters/Intermediate & Juvenile Cross Country Championships 2013. After the junior races had been completed, it was down to the Intermediate men and women to take to the stage for their 8km (Men) and 5km (Ladies) races. Chris Johnston (Letterkenny AC) won the men’s race in 26:42, with Clonmel AC’s Kevin Mansell (26:53) and Ballina AC’s Roger Barrett (27:22) in 2nd place and 3rd place respectively. Michael McKillop (St Malachy’s AC) was the first Northern Ireland runner across the line in 27:22 (6th place), while newly crowned NI & Ulster Junior Cross Country Champion Brendan Teer (East Down AC) recorded 27:32 to finish in 8th place. In the ladies race, Maria O’Sullivan (DSD AC) took top spot in 19:01, well clear of Liffey Valley AC’s Leona O’Reilly (2nd place – 19:26) and Letterkenny AC’s Fionnuala Diver (3rd place – 19:32). Omagh Harriers talented Michelle Sturm just missed a podium place after clocking 19:34 to finish in 4th place. Jessica Craig (North Down AC) claimed an excellent top ten finish, crossing the line in 19:57 to finish in 8th place, while City of Derry AC’s Catherine Whoriskey (20:15) finished in a credible 11th place. In the day’s major event, the Masters Championships, both the male and female races were close affairs. In the Men’s event, Peter Matthews (DSD AC) completed the 7km course in 23:05 with City of Derry AC’s Declan Reed (23:10) hot on his heels in 2nd place. This was enough to secure a gold medal for Declan in the Vet35 category. Annadale Striders’ new NI & Ulster Masters Cross Country Champion David Morwood (23:19) took 3rd place, meaning that he finished in the silver medal position behind Peter Matthews in the Vet40 category. Other notable performances came in the form of City of Derry AC duo Colin Roberts (24:22) and James Brown (24:46) who finished in 11th place and 19th place respectively. In the Ladies 4km race, Tullamore Harriers’ Pauline Curley led the field home in 15:13, just ahead of Mullingar Harriers’ Mary Scully (15:22) in 2nd place and Mayo AC’s Colette Tuohy (15:39) in 3rd place. Omagh Harriers’ Julie Butler was the first Northern Ireland runner across the line in 16:19 (10th place), while City of Derry AC’s Jackie McGinley (16th place – 16:41) and Clones AC’s Helen Stockdale (19th place – 16:51) also produced good performances. Full Results (including Junior Races): Athletics Ireland Masters/Intermediate & Juvenile XC Results 2013. More detailed reports are provided by our friends at Athletics NI and Athletics Ireland. On Saturday 2nd February 2013, Northern Ireland runners Eoghan Totten (Newcastle AC), Stephen Scullion (North Belfast Harriers) and Robin Brown (North Down AC) were in action at the BUCS Cross Country Championships in England. In a quality field of over three hundred competitors, all three performed to their usual high standard but it was Stephen who excelled. He recorded 33:32 over the 9.8km course to finish in 3rd place. Young Eoghan crossed the line in 34:41 (20th place), while Robin (36:02) finished in 50th place. The race was won by Steve Connor (Aldershot, Farnham and District AC). Amy Foster (City of Lisburn AC) was also in action over the weekend, competing over 60m at the Dussman Indoor Games in Luxembourg. Amy finished in 3rd place after running 7.9secs, the race was won by Dutch athlete Jumile Samuel in 7.30secs. On Saturday 2nd February 2013, East Down AC hosted their annual ‘Rollercoaster Races’ at the Downpatrick Race Course. The day began with the fun, but competitive junior races. First off was the P3 500m race, during which Unattached athlete Daniel Shiel (1:38) and East Down AC’s Anna Gardiner (1:48) impressed most. In the P4/P5 500m event, Matthew McKeown (Unattached) was victorious after crossing the line in 1:56, a mere one second ahead of the leading girl Celeste Forde (Down High Prep) who finished in 1:57. Cedar IPS’s Andrew McGrattan (3:49) and Kilamaine’s Zoe Thomson (3:49) crossed the line at the same time, thus winning their respective categories in the P6/P7 1k race. In the U-13 1.5k race, East Down AC celebrated an excellent double victory, with Tim Prenter (5:30) and Ella Carroll (6:30) both winning their categories. Meanwhile, in the U-15 2.5k event, Newcastle AC’s Daniel Molloy (10:53) and St Peters AC’s Sarah Lambert (11:15) both ran well to win. Arguably the highlight of the day followed, the ‘open’ 5k male and female race. In this, David McNeilly (Newcastle AC) looked good from the off. Having had a strong Cross Country campaign, including a victory in the ‘open’ race at the International Masters XC event, David once again showed his class. He crossed the line in 16:57 to seal victory, thirty three seconds ahead of East Down AC’s Martin Wilcox (17:30) who claimed 2nd place. David O’Flaherty (Newcastle AC) appears to be well on his way back to form after recent niggles, he ran well to secure a 3rd place finish in 17:35. In the ladies race, pre-race favourite Patricia O’Hagan (St Peter’s AC) showed why she is now considered as one of the country’s top talents, taking a comfortable win in 19:13. Ruth Magill (Lagan Valley AC) completed the undulating course in 20:54 (2nd place), while her club mate Fionnuala McCourt (22:40) claimed 3rd place. On Saturday 2nd February 2013 Sperrin Harriers hosted the fourth race of their well supported Winter League Trail Series at Drum Manor, Cookstown. In the absence of Pius McIntyre, a consistent winner in the series so far, it was Sperrin Harriers’ own Pierce McCullagh who stole the headlines. He completed the 10k course in 36:11, just ahead of Carmen Runners’ Michael Kerr (36:18) and Omagh Harriers’ Jason Walsh (36:31) who took 2nd place and 3rd place respectively. Anne Paul (City of Derry AC), previous series race winner secured victory in the ladies event. She broke the tape in 41:28, while the host clubs Rosemary Hargan (49:13) finished in 2nd place. Olivia Mullin (Greencastle AC) claimed 3rd place in 50:22. On Saturday 2nd February 2013, Kerry Harty (Newcastle AC) completed a hat-trick of 1500m wins. Racing at the Birmingham Indoor Games she clocked 4:23.79 to seal her third win in as many weeks, the time wasn’t just as fast as Kerry would have liked but a decent effort considering she had to force the pace alone. Kerry now hopes to race over 3000m in Sheffield next weekend. On Saturday 2nd February 2013, 26extreme took their Winter Series to Stormont Estate, Belfast. This was the second time the series has visited parliament buildings, with the previous event being held under moonlight. Colm McGarry (Unattached) celebrated victory, breaking the tape in 36:50. This was his first victory in the series and one he’ll remember. Regular 26extreme follower Sean Goodman (Newry City Runners) took 2nd place in 37:13, while Patrick Brennan (Unattached) claimed the final podium place in 37:25. Lagan Valley AC’s Anne Sandford was the outstanding performer in the ladies race, moving clear from the off Anne claimed victory in 40:11. Unattached athlete Barbara McCluskey (48:05) was the next lady home, ahead of (Unattached) Grace Ervine who took 3rd place in 49:23. On Saturday 2nd February 2013, well over three hundred competitors took part in the rescheduled Born 2 Run Events ‘Run Forest Run’ 10k trail race in Gosford Forest Park, Markethill. North Belfast Harriers’ Adam Boyd followed on from his impressive performance at the NI & Ulster Junior Cross Country last weekend with another outstanding display. He ran out clear winner, crossing the line in 34:20, almost two minutes ahead of Don Travers (Newry City Runners) who took 2nd place in 36:12. Brendan Grew (North Belfast Harriers) claimed 3rd place in 36:24. In the ladies race, it was pre-race favourite Karen Alexander (Sperrin Harriers) who dominated from start to finish. Setting an excellent pace, she ended up winning comfortably in 39:16 while unattached athletes Lindsey Kerr (44:04) and Emma McKenna (44:40) finished in 2nd place and 3rd place respectively.